Father Raymond G. Helmick, with a tabernacle he built at St. Theresa of Avila Church in West Roxbury. Traveling around the world, often as an unofficial emissary for peace, the Rev. Raymond G. Helmick went wherever conflicts lay unresolved — from the Catholic and Protestant divide in Northern Ireland, to the historic disputes between Israelis and Palestinians in the Middle East, and to Belgrade, where he helped negotiate the release of US soldiers who were held captive in the late 1990s. Father Helmick, who taught in BC’s School of Theology and Ministry and who was invited to the White House in 1993 for the signing of the peace accord between Israel and the Palestinian Liberation Organization, died of cancer April 21 in the Campion center in Weston. 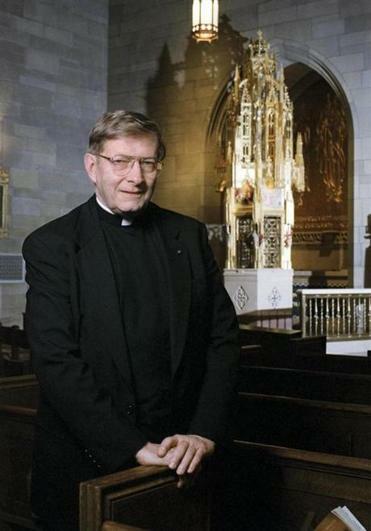 He was 84 and in recent years had divided his time between St. Mary’s Hall at BC and the rectory of St. Theresa of Avila Church in West Roxbury where his younger brother, Monsignor William M. Helmick, is pastor. Father Helmick was a founder of the US Interreligious Committee for Peace in the Middle East. Among his companions in peace efforts was the Rev. Jesse Jackson, who wrote a tribute that was posted on Father Helmick’s website a few days after his death. Father Helmick’s resume reads like a who’s who and where’s where of conflicts in the 20th century’s final decades. His peace missions included working with the Kurds in Iraq, traveling to East Timor, and spending time in Rhodesia as it became Zimbabwe. He also helped mediate the end of a hunger strike at the Maze Prison in Northern Ireland in the early 1980s. In the Middle East, he had by his own accounting “extensive contacts, by visits and correspondence” with PLO leader Yasser Arafat and Israeli leaders such as Shimon Peres, Yitzhak Shamir, Yitzhak Rabin, and Ehud Barak. In the United States, he kept State Department officials in the administrations of Ronald Reagan, George H.W. Bush, Bill Clinton, George W. Bush, and Barack Obama apprised of his peacemaking work and travels. In Boston, “as the Islamic community was mistrusted in its effort to construct a mosque in Roxbury, Father Helmick led in the effort toward its construction and toward the full inclusion of a Muslim presence in the Greater Boston Ecumenical and Interfaith community,” Rodney L. Petersen of the Boston University School of Theology wrote in a tribute that is posted online. Father Helmick was “a good example of how there’s no limit to the amount of good you can do if you don’t care who gets the credit. He was not a self-promoting person,” his brother said in an interview. The second of three children, Father Helmick was born and grew up in Arlington. His father, Raymond, was a Royal Typewriter Co. salesman. His mother, the former Alice Clancy, was a homemaker and the daughter of Irish immigrants. He twice entered the Jesuit novitiate at Shadowbrook in the Berkshires, the first time on his 18th birthday in September 1949. He left after being diagnosed with an ulcer, and then re-applied and returned in 1951. He received bachelor’s and master’s degrees in philosophy from Weston College and taught at St. George’s College in Jamaica. Then he moved to Germany to study theology at Sankt Georgen in Frankfurt before being ordained a priest in 1963. Father Helmick taught in Connecticut and Jamaica, did doctoral studies in New York, and worked for human rights organizations in London and Washington, D.C., before becoming an instructor at BC in 1984. He also wrote and edited several books. “He wanted students to know that there’s a role for person-to-person contact,” said Stephen J. Pope, a theology professor at Boston College who had chaired the department while Father Helmick taught there. “He had an unusual combination of being very gentle, but also fearless,” Pope said.